Love it or hate it, you have to admit that social media has done a lot for mankind! We’ve reconnected with old friends and met new ones on Facebook! We can send our favourite celeb a tweet over on Twitter and we can post numerous selfies over on Instagram! Social media keeps us connected and gives a bit of a lifeline to those who often feel disconnected from the world or lonely, as there are numerous support groups over on Facebook, in everything from mental health to crafting with cat hair, there’s always an easy way to connect with likeminded people! However (and it is a big however!) it has done some pretty awful things for us too! Take Instagram for example, Insta certainly seems to be the one that YouTubers and beauty influencers use the most to push their latest look or beauty trend! Which is fine, I hear you say, but no, sometimes it’s NOT fine, sometimes it’s three buses, a plane ride and short walk away from fine! 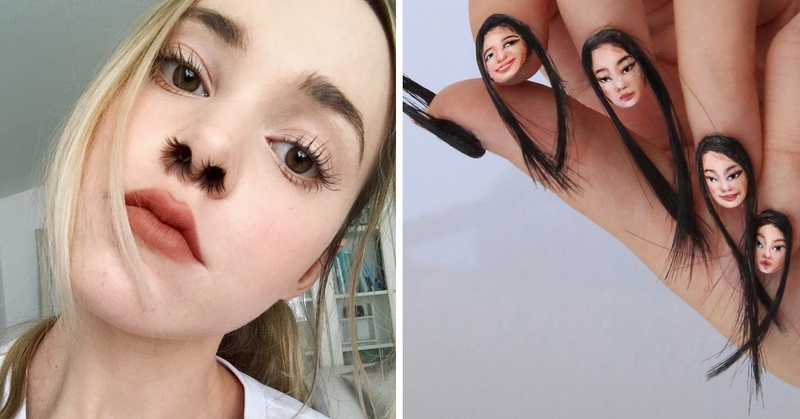 As these next 20 examples show, some of the crazy beauty trends that find their way onto Instagram and actually become popular…just need to get right in the bin! I don’t know about you, but just looking at this is making me feel quite ill. To think that this has actually become a popular trend over on Instagram is actually quite perplexing and nauseating! It actually makes me worry about humanity!